How Does Attitude Impact Leadership? Attitudes have the potential to build up or tear down the success of teams and its leadership. Therefore, the more we understand attitudes the greater is our potential to lead a successful team. Many have learned that talent is not enough to bring success to a team. Yes, you need talented people but also you need people with a good attitude. As John Maxwell writes, "Good attitudes among players do not guarantee a team's success, but bad attitudes guarantee its failure." In other words, talent plus good attitude usually brings success to teams. However, talent plus rotten attitude usually destroys teams. There are five truths about attitudes that affect teamwork and leadership. Too many people want to believe that talent is enough bring success to teams. Any yet, experience tends to tell us that outstanding results usually come as a result of good people with great talent and awesome attitudes. As Maxwell writes, "When attitudes go up, so does the potential of the team. When attitudes go down, the potential of the team goes with it." As the old adage says, "A team of champions does not equate to a champion team." There are several things that are not contagious to a team: talent, experience and willingness to practice. However, attitudes are contagious. In fact, they can be very contagious. When someone displays a teachable spirit and humility, others tend to want to be like that. When someone displays a great work ethic and begins to improve, others tend to be inspired to do likewise. As Maxwell writes, "People become inspired by their peers. People have a tendency to adopt the attitudes of those they spend time with - to pick up on their mind-sets, beliefs and approaches to challenges." 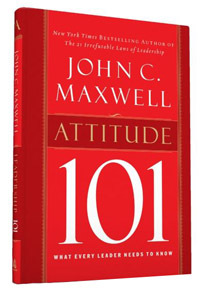 As Maxwell states, "There is only one thing more contagious than a good attitude - a bad attitude. Sometimes people think a negative attitude is ok. After all, it doesn't really hurt anyone. However, that's not true. The truth is that a negative attitude only hurts people. It seldom helps people. But the sad reality of a negative attitude is that it often spreads very quickly and it undermines the inspiration of the team. Maxwell writes, "Have you ever interacted with someone for the first time ans suspected that his attitude was poor, yet you were unable to put your finger on exactly what was wrong? I believe many people have that experience." Attitudes are subjective and sometimes it is hard to put your finger on what the problem is. However, people with bad attitudes usually let it overflow into their everyday experience. People with bad attitudes find it difficult to admit wrongdoings. Mr. Perfect! Everyone else is wrong! These types of people seldom make good teammates. People with bad attitudes find it difficult to forgive. They blame everyone except themselves. They hold grudges and are very bitter. Again, people like that do not make good teammates. People with bad attitudes are usually self-centered. Everything is about them. They develop an overpowering belief in their own importance. People with bad attitudes are usually very critical. As Maxwell writes, "When someone on the team has a critical spirit, everybody knows it because everyone on the team can do no right." As Maxwell says, "Bad attitudes must be addressed. You can be sure that they will always cause dissension, resentment, combativeness and division on a team. And they will never go away on their own if they are left unaddressed. They will simply fester and ruin a team - along with its chances of reaching its potential." Dealing with people who have a bad attitude can be very tricky. However, to leave it unaddressed is even worst. In the end, you must deal with it, otherwise it will affect the performance of your team. To read this article by the original author, click on the following link How Does Attitude Impact Leadership.